The following is my forensic statement analysis from portions of James Comey ‘s nearly 3-hour testimony during the Senate Intelligence Committee hearing on 8 June 2017. Comey, the former F.B.I. director, was fired by President Trump in May 2017. At the end of the content analysis you will also find a body language analysis. You can see the entire video testimony here. It is important to note that I did watch the entire testimony and have the entire transcript. Therefore, my analysis below is taken in context. Standing alone some deception markers annotated in red, may not seem noteworthy to the reader; although looked at in its entirety with baseline responses, the change of baseline is what is key. For example, if Mr. Comey answered in the affirmative “Yes” to most all questions, then on some he responded “Sure.” that is noteworthy. Due to the fact that the FBI and an on-going investigation are involved, it is reasonable to expect that certain information could not be discussed during the Senate hearing in an open setting. Without ground truth, or classified security clearance, it’s impossible to determine what the responses would have been, which could have a direct result on this analysis. It is also impossible to determine if any of his refusal to answer responses were an opportunity to omit relevant information. Absence of evidence is not evidence. COMEY: Honestly, no. I mean, it caused a whole lot of personal pain for me, but, as I look back, given what I knew at the time and even what I’ve learned since, I think it was the best way to try and protect the justice institution, including the FBI. (***1. Extra words, known as qualifying words, are sometimes used to show us the person is being deceptive. They’re often used in an attempt to bolster credibility. “Honestly” is a qualifying word, similar to the phrases, I swear to God, to tell you the truth, in fact, etc. 2. The word “think” means there is the possibility he may be wrong. 3. “Try” means attempted by failed; did not complete or did not do what the statement indicated if he only tried. WARNER at 1:02:08: Now, you’ve had extensive experience at the Department of Justice and at the FBI. You’ve worked under presidents of both parties. What was it about that meeting that led you to determine that you needed to start putting down a written record? WARNER: Did you feel that you needed to create this written record or (ph) these memos because they might need to be relied on at some future date? When I was deputy attorney general, I had one one-on-one meeting with President Bush about a very important and difficult national security matter. I didn’t write a memo documenting that conversation either — sent a quick e-mail to my staff to let them know there was something going on, but I didn’t feel, with President Bush, the need to document it in that way, again (ph), because of — the combination of those factors just wasn’t present with either President Bush or President Obama. And I — I — as I said in my written testimony, as FBI director, I interacted with President Obama. I spoke only twice in three years and didn’t document it. When I was deputy attorney general, I had one one-on-one meeting with President Bush about a very important and difficult national security matter. (***1. Omitting of pronouns. Pronouns, or lack of, are quite revealing. If you find missing pronouns in a statement, that is significant. He failed to say He sent a quick email to his staff. Pronouns indicate responsibility. If people don’t want to take responsibility for their actions, or if they can’t truthfully assign responsibility to another person, pronouns will be omitted altogether. The missing pronoun indicates there is stress or strain and a lack of commitment to their statement. The person may not have done what he wants you to believe he has done. 2. “Three” – The number three is a liar’s number. When deceptive people have to come up with a number they will often choose the number three. Some people view the number three as being a complete number as in “Life, Birth and Death” or “Body, Mind and Spirit.” We also have three primary colors which all other colors come from. It may be that when deceptive people use the number they feel they are giving a whole and thorough number. COMEY at 1:08:00 : Well, my impression — and, again, it’s my impression. I could always be wrong. But my common sense told me that what was going on is either he had concluded, or someone had told him, that you didn’t — you’ve already asked Comey to stay, and you didn’t get anything for it, and that the dinner was an effort to build a relationship — in fact, he asked specifically — of loyalty in the context of asking me to stay. WARNER: And that was just a few days before you were fired? COMEY: … yeah, that was on the 20 — the Sunday after the inauguration. The next Friday, I have dinner, and the president begins by wanting to talk about my job. And so I’m sitting there, thinking, “Wait a minute, three times, we’ve already — you’ve already asked me to stay, or talked about me staying. And my common sense — again, I could be wrong, but my common sense told me what’s going on here is that he’s looking to get something in exchange for granting my request to stay in the job. COMEY: No, and what made me uneasy was I’m, at that point, the director of the FBI. The reason that Congress created a ten-year term is so that the director is not feeling as if they’re serving at — with political loyalty owed to any particular person. The — the statue of Justice has a blindfold on because you’re not supposed to be peeking out to see whether your patron is pleased or not with what you’re doing. It should be about the facts and the law. (***1. He is using present tense verbs. Looking at the verb tenses helps to determine if a person’s statement is coming from memory or from their imagination. As a general rule, statements should be written in the past tense because the incident has already taken place. Verb tenses refer to the time the action is taking place. In an open statement, the person should be telling what happened or what he witnessed. Therefore, he should be speaking in the past tense. It doesn’t matter if he is talking about something that happened five minutes ago or five months ago. He should be using past tense verbs as he tells his story. 2. “Three” See above. The number three is a liar’s number. When deceptive people have to come up with a number they will often choose the number three. FEINSTEIN: Let me begin with one overarching question. Why do you believe you were fired? COMEY: Guess I don’t know for sure. I believe the — I take the president at his word, that I was fired because of the Russia investigation. Something about the way I was conducting it, the president felt, created pressure on him that he wanted to relieve. Again, I didn’t know that at the time, but I watched his interview, I’ve read the press accounts of his conversations. So I take him at his word there. Now, look, I — I could be wrong. Maybe he’s saying something that’s not true. But I take him at his word, at least based on what I know now. (***1. Omitting of personal pronoun I. 2. “Guess” is like “think: or “believe”, he’s not convinced. RUBIO at 1:31:05: Did you perceive that to be a statement that — I took care of you, I — I didn’t do something because you told me he was a good guy. So now, you know, I’m asking you, potentially, for something in return? Is that how you perceived it? COMEY: I wasn’t sure what to make of it, honestly. (***Deceptive qualifying word). WYDEN at 1:37: What was it about the Attorney General’s own interactions with the Russians, or his behavior with regard to the investigation, that would have led the entire leadership of the FBI to make this decision? WYDEN: Flynn is gone, but other individuals with contacts with the Russians are still in extremely important positions of power. Should the American people have the same sense of urgency now, with respect to them? HEINRICH : A lot of this comes down to, who should we believe? Do you want to say anything as to why we should believe you? MANCHIN at 2:25: And you also mentioned you had — I think, what, six — six meetings — three times in person, six on the phone, nine times (ph) in conversation with the president. Did he ever, at that time, allude that you were not performing adequately — ever indicate that at all? COTTON: Senator Feinstein said, “Well, no. No, it hasn’t.” Do you have any reason to doubt those statements? MCCAIN at 3:03: Yeah, but I — I think it would intensely arouse my curiosity if the president of the United States said “We had that thing, you know” — I’d like to know what the hell that thing is, particularly if I’m the director of the FBI. 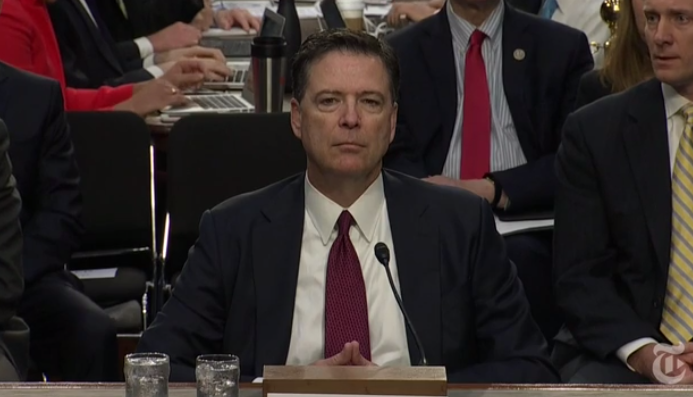 COMEY: And although the law required no reason at all to fire an FBI director, the administration then chose to defame me and, more importantly, the FBI by saying that the organization was in disarray, that it was poorly led, that the workforce had lost confidence in its leader. BURR: Is there any doubt in your mind that this committee can carry out its oversight role in the 2016 Russian involvement in the elections in parallel with the — now — special counsel that’s been set up? WARNER: Now, you’ve had extensive experience at the Department of Justice and at the FBI. You’ve worked under presidents of both parties. What was it about that meeting that led you to determine that you needed to start putting down a written record? COMEY: Sure, and — and the — the leader who had that view — it didn’t change. His view was still that it was probably — although literally true, his concern was it could be misleading, because the nature of the investigation was such that it might well touch — (Contradictory single shoulder shrug – not believing himself what he is verbally saying) obviously, it would touch the campaign, and the person at the head of the campaign would be the candidate. And so that was his view throughout. Lastly, keep in mind that in a deception analysis, the shortest sentence is the best sentence to indicate credibility. If there are extra words presented – in fact, honestly, I swear, truthfully, actually, for sure, y’know, and many others, that is an area that needs to be examined closely for deception.